Dr. Angelova received her Ph.D. degree in Physical Chemistry from the Bulgarian Academy of Sciences, where she was appointed a Research Associate in 1992, and performed post-doctoral studies at the European Molecular Biology Laboratory (EMBL Hamburg Outstation at DESY), Max-Plank-Institute for Colloids and Interfaces (Berlin), University of Potsdam, University of Mons-Hainaut(Belgium), and Paris-Sud 11 University. Dr. Angelova has been a Senior Scientist in the Biosensors group of IMEC(Leuven, Belgium) and a Research Associate at the Department "Model Membranes" of the Institute of Biophysics (Sofia) prior joining the Department "Physical Chemistry of Polyphase Systems" of CNRS UMR8612 Institut Galien Paris-Sud (Paris-Sud 11 University) in 2005. 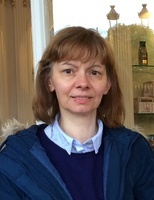 Her current research interests at CNRS/Paris-Saclay University are in the field of lipid/protein assemblies, structure and dynamics of biomimetic systems, liquid crystalline phases and phase transitions, protein clustering, nucleationand crystallization in lipid membranes, self-assembled lipid nanocarrers(cubosomes, hexosomes, spongosomes) of the rapeutic molecules, and acellular model of neurodegeneration. Abstract: Nanomedicine development for treatment of neurodegenerative disorders requires more efficient drug delivery carriers with tunable internal organizations and an increased capacity for co-encapsulation of biomolecules. Using self-assembly of lipids and neuroprotective compounds, we created multicompartment drug delivery nanocarriers of lyotropic liquid crystalline nature. Some of the carriers displayed hierarchical architectures, which are suitable for the confinement and delivery of various biopharmaceuticals. Co-encapsulation was performed with the rapeutic molecules such as the the rapeutic protein BDNF [brain-derived neurotrophic factor, plasmid DNA encoding for neurotrophins, w-3 polyunsaturated fatty acids, and antioxidants. We realized structural studies of the generated liquid crystalline nanoassemblies by time-resolved small-angle X-ray scattering (SAXS) and cryo-transmission electron microscopy (cryo-TEM). Long-living states of nonlamellar lipid membrane organization (corresponding to a diamond-type cubic phase with large water channels) were found along with other intermediate structures during the formation of bicontinuous cubosome-type nanoarchitectures. The cubosome lipid nanoparticles were stabilized by a PEGylated corona. The in vitro biological activity of the investigated lipid nanocarriers loaded by the rapeutic biomolecules was examined using a cellular model of neurodegeneration. 1. Angelova, A., Drechsler, M., Garamus, V. M.; Angelov B., ACS Omega, 2018, 3, 3235–3247. 2. Angelov, B.; Angelova, A.; Filippov, S.; Drechsler, M. et al. ACS Nano, 2014, 8, 5216-5226. 3. Angelov, B.; Garamus, V. M.; Drechsler, M.; Angelova, A. J. Molec. Liquids 2017, 235, 83–89. 4. Guerzoni, L.P.B. ; Nicolas, V.; Angelova, A. Pharmaceutical Research, 2017, 34, 492-505. 5. Angelova, A.; Angelov, B., . Neural Regeneration Research, 2017, 12, 886-889. 6. Angelov, B.; Angelova, A., Nanoscale, 2017, 9, 9797–9804. 7. Angelov, B.; Angelova, A.; Filippov, S.K. et al. J. Phys. Chem. Lett., 2013, 4, 1959–1964. 8. Angelov, B.; Angelova, A.; Garamus, V.M. ; Drechsler, M., et al. Langmuir, 2012, 28, 16647–16655.